Get Guidance on How to Enroll and Initiate the Verification Process to Protect your Organization from Lost Revenue! 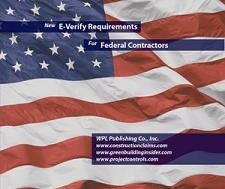 All federal contracts awarded after September 8, 2009 are subject to mandatory new E-Verification requirements for certain employees and independent contractors. The new regulations were designed to improve accuracy of wage and tax reporting and to guarantee a legal workforce on all federal projects. Failure to comply could result in suspension or debarment, adverse performance assessment and termination for default and damages. This recorded webinar will offer guidance to contractors, subcontractors, construction managers and other parties that work on federal government construction projects. Whether you are already enrolled in E-Verify in anticipation of a contract award, but have not yet verified employees or if you’re already enrolled and familiar with the verification process, this webinar will reinforce existing rules and will cover the option of verifying all employees versus only those employees assigned to federal contract work. Jonathan A. DeMella, an attorney with Oles Morrison Rinker & Baker, has dedicated his practice to finding innovative and effective solutions for clients faced with the challenging prospect of litigation. He has considerable experience assisting contractors involved in disputes with the Federal Government and has counseled clients in many areas of construction and government contract law. Prior to joining OMRB in Seattle, Jonathan practiced in Washington, D.C. litigating for a large internationally recognized law firm. Following graduation from The American University Washington College of Law, Jonathan clerked for the Honorable Christine O.C. Miller of the U.S. Court of Federal Claims. James F. Nagle, also with Oles Morrison Rinker & Baker LLP, is a frequent lecturer on federal government contracts and construction law. He teaches a four and one-half day course on Government Contract Law for Educational Services Institute on behalf of George Washington University and has taught Government Contracts for the University of Washington and Seattle University. Mr. Nagle, who received his J.D. from Rutgers University, has authored numerous books and more than 80 articles in nationally distributed publications. He was honored by the Boards of Contract Appeals, Bar Association with the Life Services Award.Seattle, Jonathan practiced in Washington, D.C. litigating for a large internationally recognized law firm. Following graduation from The American University Washington College of Law, Jonathan clerked for the Honorable Christine O.C. Miller of the U.S. Court of Federal Claims. Ranea Saade, Oles Morrison Rinker & Baker, routinely represents employers in various employment law matters, including drafting, revising, and enforcing their employee manuals, non-compete/non-solicitation agreements, and employment contracts. Renea also provides on-site training for her clients on the topics of preventing harassment and discrimination in the workplace and wage/hour compliance. Renea regularly appears before federal and state courts and defends employers against claims of sexual harassment, religious, racial, disability, and gender discrimination. She also defends clients against wage/hour claims. Renea represents employers in agency audits and investigations, including, but not limited to, those performed by the EEOC, Washington State Human Rights Commission, U.S. Department of Labor, Washington State Department of Labor & Industries. In addition to her representation of employers, Renea also represents businesses in various contract disputes.